It’s about time I brought you all another decadent dessert recipe that just happens to be VEGAN, GLUTEN-FREE, & REFINED-SUGAR FREE! 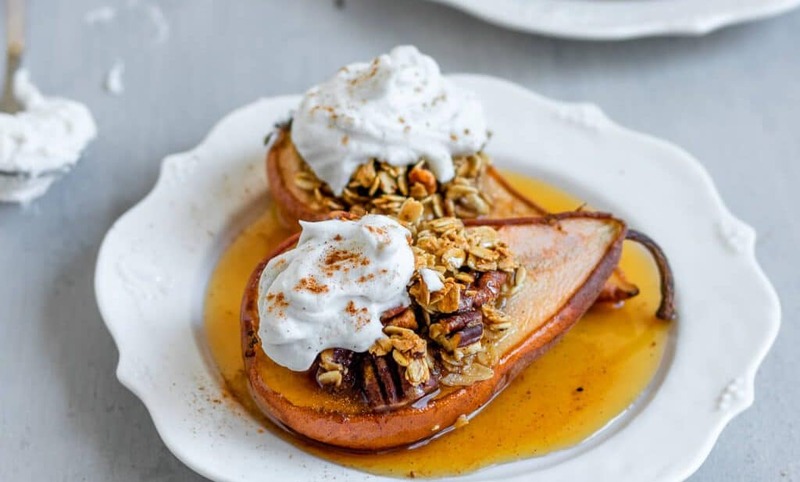 These healthier Baked Maple Cinnamon Stuffed Pears not only feature beautiful seasonal bosc pears but are healthy too. So what are you waiting for?! 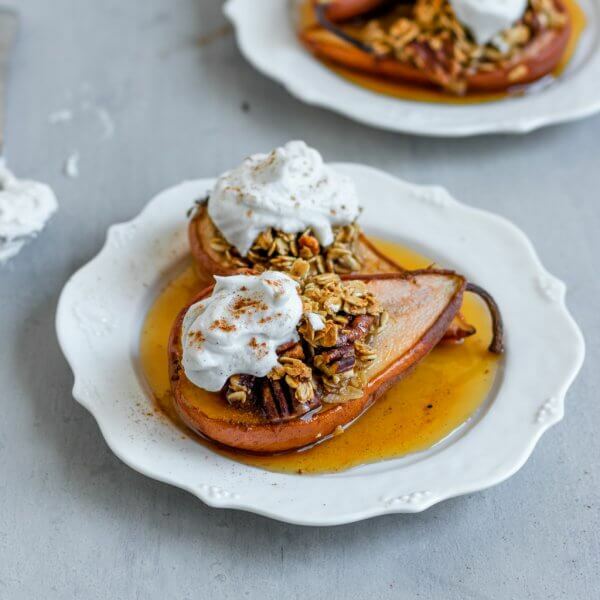 Time to use up those pears I know you have sitting in your fridge and go bake these Vegan & GF Baked Maple Cinnamon Stuffed Pears today! Like a parfait, but Better! I like to think of these pears as a parfait, but like, ten times better. So, let’s talk about the layers. On the bottom is the pear that gets baked until it is soft and easily pierceable with a knife. Next comes the Maple Cinnamon Granola. This is a mixture of gluten-free oats, cinnamon, maple syrup, salt, and vanilla. 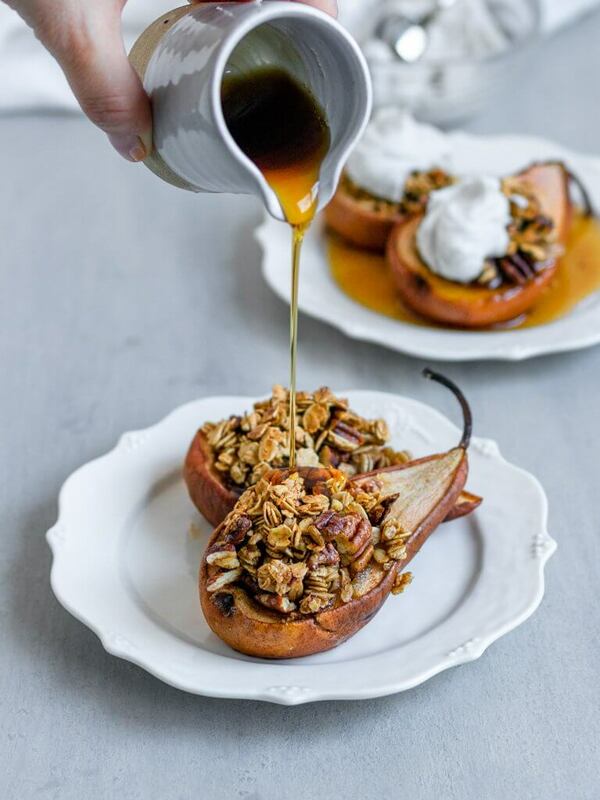 Ps- definitely DO use a high-quality maple syrup in this recipe! 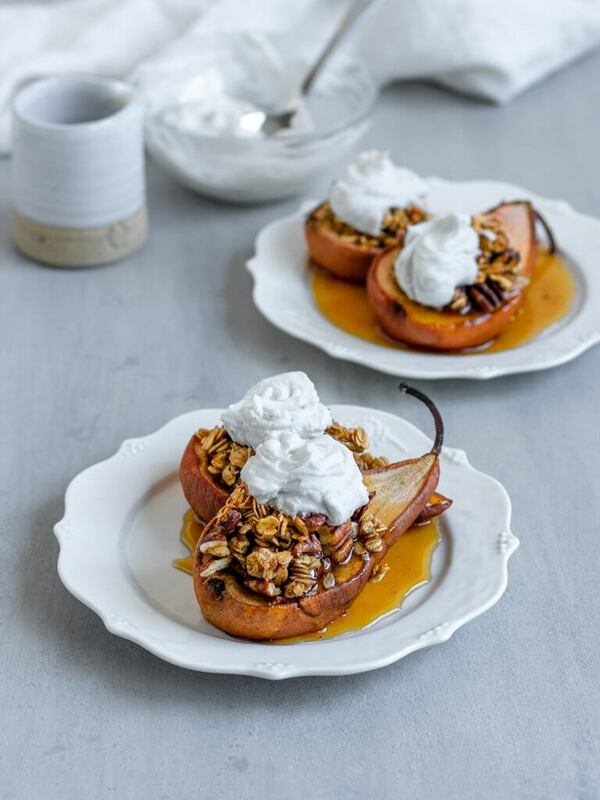 Once the pear and granola get baked together, I recommend topping these pears with some decadent vegan coconut whipped cream. I always follow Minimalist Baker’s tried and true recipe for coconut whipped cream. 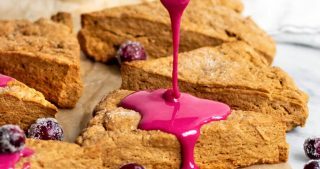 You can add a little maple syrup in place of powdered sugar to keep this refined-sugar free, though it won’t be as sweet. After adding that whipped cream, add a dash of extra cinnamon and drizzle of maple syrup as the final touch! Like I said, you have the layers and flavor of a parfait, but with zero of the guilt! I always love to share the brands and tools I use to create my recipes, so check out these favorites of mine below! Some really darn good maple syrup, like Coombs Family Farms Maple Syrup. Delicious Organic Cinnamon & Nutmeg for that perfect kick of spice. Bob’s Red Mill Gluten Free Oats for that perfect crispy stuffing. Coconut Cream to whip into the perfect topping! Heilala Vanilla Bean Paste or Extract. PS- You can you the code “SGTOSAVE20” at checkout on Amazon to save 20% off Heilala purchases through May 31st, 2019. Whoop!! Chopped Pecans for that nutty crunch. Lastly.. the perfect dish to bake everything in! In other news, I have been recipe testing like a maniac over here. Why you might ask?! Well, not only do I have some fun client work coming up, but I also am about to head into a crazy season of travel at the end of April. Whidbey Island and New Orleans are first on the agenda so I know I’ll be coming home with some fun recipe inspiration. However, all the travel does require some serious planning ahead to make sure I can get a delicious and well-tested recipe ready every Wednesday. Between these Vegan & GF Baked Maple Cinnamon Stuffed Pears & next week’s chocolate filled treat, I am setting you all up to enjoy some good months of baking ahead. Let’s be honest, come May I know all you really want to do is make fresh salads, pretty popsicles, and fruit-filled cocktails anyways. So, I’m going to keep the baking party going until then for all of us! 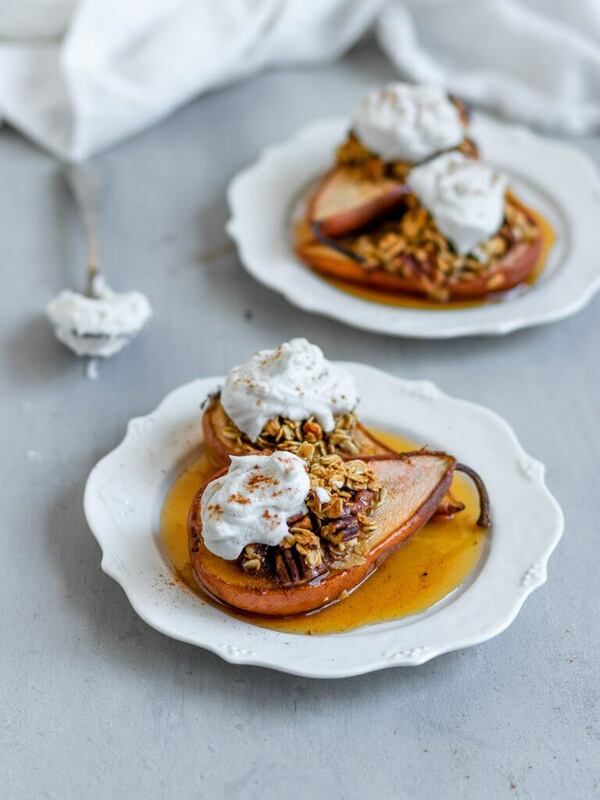 Hope you enjoy this healthier pear dessert! Slice your pears in half and scoop the seeds from the center to leave space for the filling. Cut off a tiny slice of the pear bottom so that the pears lie flat. Next, add your gluten-free oats, maple syrup, chopped pecans, vanilla, ground cinnamon, nutmeg, and salt to a mixing bowl and stir to combine. Stuff the filling into the pears until you use all the stuffing. The stuffing will be piled high. Next, place the stuffed pears into a greased ceramic or glass baking dish of any size. Add to the oven and bake for 40-50 minutes until the pears are soft and the topping has crisped. 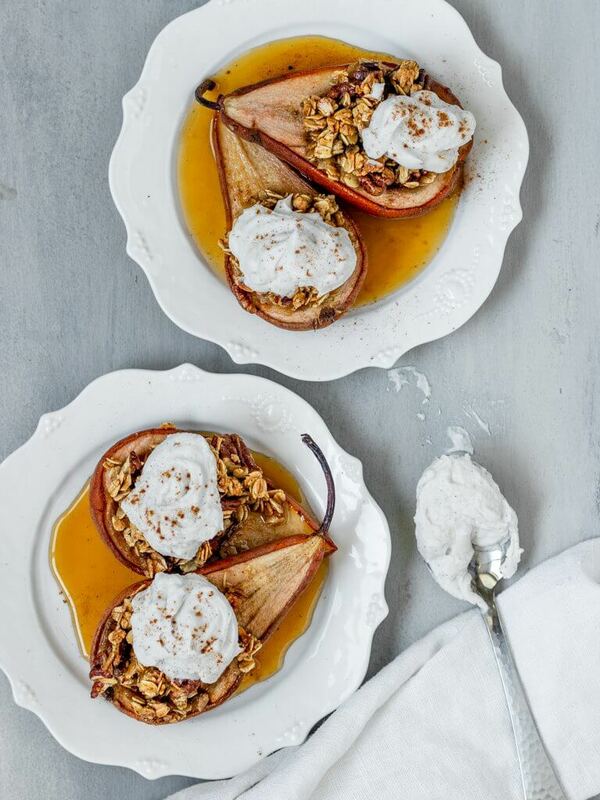 Remove the stuffed pears from the tray and let cool. For an extra touch, top with vanilla coconut whipped cream or vegan ice cream with a dash of cinnamon. Enjoy!